In this, the concluding portion of his interview with Gerald Klickstein, Joseph Robinson recalls his teacher Marcel Tabuteau, recounts some of the complexities of orchestral work, and offers sage advice to rising musicians. GK: Were there some low points in your career? How did you deal with them? JR: Oboists, like baseball players, have inexplicable slumps when they cannot find a way to make acceptable reeds. These times could stretch into weeks for me, and of course, they were frustrating and depressing, although they were mostly unrecognized by colleagues and conductors. There is a saying in the profession that “You are only as good as your last performance.” It was hard to stay upbeat after a lackluster concert, but I just kept trying different cane and gouges until the reeds improved. GK: Did you have musical interests that orchestral playing didn’t fulfill and, if so, how did you pursue those interests? JR: With regard to outside musical activity, my status in the NYP prompted more invitations for solo appearances, recitals, master classes, and speaking engagements than I could accept. 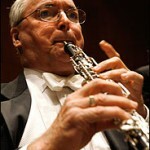 In that respect, it was as if the “rich just got richer.” One problem with my broader education and training is that I sometimes felt too strapped down in the “oboe saddle.” John Mack used to ask me, as Zubin Mehta did a time or two, “Isn’t playing first oboe in the Philharmonic enough for you?” Sometimes it felt like too much of a good thing! Still, despite an encouraging start with management at the New York Philharmonic, when I was entrusted with arranging area committee musicales in the suburbs and often spoke on behalf of the orchestra to prospective patrons, I feel that I failed to demonstrate that a member of the orchestra could be an effective advocate and partner in institution-building and development. GK: In what ways did your role in the Philharmonic evolve over the years? GK: As a veteran orchestral performer, what are some key things that you know today that you didn’t know during your initial years with the Philharmonic? JR: It is the quality of one’s affection for performing that sustains a long career in a major orchestra. Stanley Drucker loved to play the clarinet more than any player I have ever known—so much that I used to say about him, “God made a clarinet player and called him Stanley!” Of course good luck and good genes had something to do with his longevity, but Stanley continued to restore his musical and technical “capital” by relentless practice through the years. I’m afraid I stepped into the same quicksand as my famous predecessor, Harold Gomberg, who increasingly sought to rely on a good reed rather than a regimen of regular practice to sustain his career. GK: Many young musicians hope to perform in professional orchestras, yet they realize that jobs are scarce. In your view, are there audition or career-preparation strategies that aspiring musicians should keep in mind that sometimes get overlooked? JR: Aspiring musicians should only occasionally look up for motivation at the career peaks they dream of scaling. Progress toward career success is best achieved indirectly, one beautiful note, one coherent phrase, at a time. If the gap between one’s own level of performance and that of the best players is honestly perceived and patiently narrowed, career achievement will eventually take care of itself. In addition, it is important to remember that many opportunities to serve the art of music are self-generated by resourceful people, and that imaginative entrepreneurship can sometimes be as important as practice. GK: You didn’t major in music in college but instead graduated from Davidson College with a degree in English and economics. How did your educational choices affect your musical development? JR: Marcel Tabuteau, the greatest player and oboe pedagogue of the 20th century, used to urge his students at Curtis to learn from life in all its effusions and not just sit hunkered down at the reed desk. I believe my sense of musical line was informed by hours spent as a young man on the Blue Ridge Parkway; my sense of rhythm and texture by my study of English poetry; my interest in color and form by painting. Educational success at Davidson College resulted in a Fulbright Award that made it possible for me to encounter Marcel Tabuteau in France in March of 1963, and it was my being an English major that prompted him to agree to teach me the following summer. (Unknown to me, he had one piece of unfinished business when I met him, which was to produce a method book for which I might possibly be the author.) The instruction I received from Marcel Tabuteau during five weeks of lessons in Nice more than compensated for the conservatory training I did not receive. GK: Do you have any suggestions regarding how orchestras can prosper in the 21st century? In that article, I proposed with utmost seriousness and total conviction that orchestras could dramatically increase public interest in their activities without dumbing down their repertory if they would stage overtly competitive events “against” each other. Civic competition prompted the creation of many American orchestras in the first place, and comparisons justifying membership in the “Top Five” are a continual fact of orchestral life. If the New York Philharmonic challenged the Metropolitan Opera Orchestra to a Wagner “shoot-out” in Carnegie Hall, partisans would march on 57th Street! Imagine what fun it would be to see Dallas and Houston go at it for Texas bragging rights, or for Atlanta and St. Louis—two heartland cities with American-born conductors and huge sports traditions—to challenge each other home and away! Competing orchestras would play sky high on the edge of their chairs, and husbands and wives would argue over breakfast the next morning about which one had the better brass section. GK: Are there additional points, recollections, or pointers for rising players that you’d like to add? Wonderful interview! Joe is so right. The relationship between players that sit side by side in an orchestra is very intimate. The most fascinating thing is that it exists and thrives with very few words. It is all about shared feelings about the music, instinctive accommodation, and a willingness to share a multitude of experiences together with generosity and a spirit of adventure. I believe that in our years together in New York, we had all of that!